The Walled City had a fantastic premise. 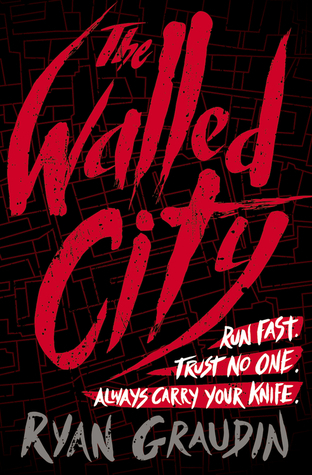 I love the tagline for it "There are three rules to the Walled City. Run fast. Trust no one. Always carry your knife. Right now, my life depends completely on the first. Run, run, run." Told from three different perspectives it follows a a girl, Jin, disguising herself as a boy in order to find her lost sister. Mei Yee, the lost sister that was sold to a brothel by her own father, and Jin, the boy who found himself in the walled city, a filthy, dirty, and dangerous world unaccustomed to. I really liked how different each character was even though I am not the biggest fan of multiple POVs. I have to admit though… the book slightly bored me. There wasn't enough action and character depth for me to invest in either one. I know all three have it tough for them, but I felt that an emotional connection between the reader and the characters was lacking, at least for me. I do love how Graudin created this chinese inspired dystopian world. I'm all for diverse cultural characters and settings. I wish we got to know more people outside of these three. It seemed somewhat ridiculous how only three characters set up the whole book with little to no exposure to other characters. I personally can't put my finger on why exactly I didn't enjoy this book as much as I hoped, but it comes down to me not being invested in the story as well as reading it for long periods of time. I love the gender bender theme in The Walled City, with Jin disguising herself as a guy, but I wish Graudin played more with the idea, used it to better the book. It just seemed as a convenient placement in the book to allow Jin to search for her sister, I wish it had more of a purpose. As for the romance.. I did not like it. It does involve Dai but which of the sisters? I can't say without spoiling. All I can say is that I disliked the direction Graudin did and hoped with all my heart, while halfway through the book, it wouldn't go that way but alas.. it did. The action scenes though, when they appeared, were fantastic, especially Jin and her quick thinking and smart execution. I really did like Jin and wished she led the show. I would look forward to her chapters as opposed to Mei Yee… who I somehow didn't really like or care for. One thing to note is that Graudin painted a harsh world, but it was very realistic. I dislike how sometimes YA books gloss horrific events and situations in our world and I appreciated Graudin for not shying away from giving us as realistic of a picture as possible. I did end up liking The Walled City, I just wish I liked it more. My emotional disconnection with the characters was the main reason why I didn't enjoy it. So if you think you could connect with these characters, then I suggest you pick up The Walled City. Aw that is too bad that you didn't like the book. I thought the idea of a girl disguised as a boy would add something as well but if you said it wasn't used the right way then that will disappoint me. Plus if the overall storyline just bored you then there isn't much hope for this one. If you want a book where the girl had to pretend to be a boy and it actually means something try Alanna by Tamora Pierce. I like the pictures you included! :) GENDER BENDER. One of the things I can't get enough of. I like that he doesn't shy away from being realistic and I love action-scenes. It's a shame that a lot of things weren't perfect, but I might give it a shot anyway.